Who is an hourly employee? Well, an hourly employee is a person who is paid on the basis of hours of work done by him. Unlike salaried employees, who are given a flat salary irrespective of the number of hours they have worked. The employees who are paid on per hour basis need to be paid the minimum wage. If the hourly workers work over 40 hours in a week, then they are eligible for overtime pay. The wage of an hourly worker is determined by the number of hours worked by him. Based on the agreements, they receive a pre-determined rate, which is calculated based on different aspects like overtime, straight working hours, the number of holidays worked and weekends. How much the hourly workers should be paid is determined by the federal and state laws. These laws determine their minimum wage and overtime pay. One of the benefits of using hourly employees is the fact that they offer lots of flexibility. As an employer, you will have the option of reducing your cost when the sales volume goes down. You can do this by allocating lesser hours for them. However, it depends on the contract you had with them. You might end up losing your employees if they cannot rely on min yearly wage; the hourly employees will accept their cuts in work hours. In small organizations, hourly employees don’t receive certain benefits like 401 (k) match or health insurance. In companies where hourly workers are the backbone of their production and entire operation, there they receive all kinds of facilities and benefits. In case of salaried employees, they need to meet certain pre-determined guidelines laid down by the Fair Labor Standards Act in order to get exemption from overtime requirements and minimum wage. This is not applicable in case of hourly workers. An Employee in Hourly or Salaried – How to determine? Whether their status are not exempt or exempt from overtime. As per the Federal Law, an hourly employee will be eligible to receive overtime payment if he/she works in excess of hours in a week. The rate of pay and the date of paying the overtime is being regulated by the state laws. When it comes to hourly employees, an employer can certainly be more generous to him with the overtime rates. As per hour laws and Federal wage all the employees are expected to receive overtime. However, there are some who have been exempted from overtime. Managers, professional employees and supervisors are the ones who are exempt. How to Find Hourly Employees? Hourly employees constitute more than 60% of America’s total workforce. Hourly employees are not only feasible for the employers, but for the employees themselves, this is a much more flexible option. The figure itself shows that the number of hourly employees is surprisingly huge in America and the number seems to be increasing. However, as an employer, you would want the best ones working for you. This is the reason why it is very important to know about the right sources from where you can hunt good, qualified and efficient hourly employees. Let me make something very clear. Hunting for hourly employees doesn’t mean that you need to look into some unconventional sources. You can use the same sources which you use to get hold of the salaried ones. 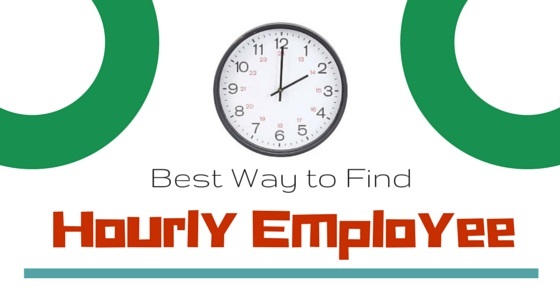 Here are some of the sources which might help to find good and qualified hourly employees. Internal sources have always been the most reliable option for recruitment. Your present, existing employees; who knows about the work culture, the job profile and what are the skill sets required for a particular profile are the most convenient and reliable options for you to explore. A large section of the recruitment is being done through the internal sources and more often than not, they turn out to be worthwhile. Recruiting from internal sources means that the person you are hiring is being referred by one of your existing employees, which means, he/she in some ways is connected to the person. This would ensure that your new recruit would try to be efficient and would work hard to live up to your expectations. Internal sources are the most traditional ways of hiring new employees and it is equally effective when it comes to hiring hourly employees. If you have an immediate requirement for fewer hourly workers and you want to hire fewer as quickly as possible, then the best option for you would be to tap those sources which will not waste time in the name of formalities. Apart from the internal sources, your former employees might come handy in this regard. It is a common practice to refer one’s son, nephew or any other relatives to the work place one has been for a long period of time. Speak to your former employees and ask them if they can help you get a few of them. The chances are most likely that you might find what you are looking for. Moreover, being their former workplace, they would certainly want to refer someone who would serve you to the best of his abilities. The chances of getting honest, efficient and hardworking hourly employees from your former ones are quite high. You can certainly count on them to meet your demands for hourly employees. This is another very effective way to hire good hourly employees. If you are in immediate requirement, then you may invite people for a walk in interview. This is one of the best options as it gives you the chance to test their skills, attitude and make an assessment whether they would fit into the profile properly or not. Walk in interviews have always been one of the best recruitment options for the employers. It also gives the candidates a chance to get a feel of the environment and assess what they can expect from the company. Be it hiring salaried employees or hourly ones, walk in interviews have always been the most convenient and feasible option. Candidates keep sending their job applications. It is a smart thing to keep them aside safely for future reference. During the hour of needs, these are the ones you can refer to. It is most likely that you will find a candidate or two of your choice. The next thing you need to do is to get in touch with them, call them for an interview; see for yourself if indeed they are capable of meeting your requirements. If all goes right, then very soon you will have a couple of good hourly employees working for you. Often, students are looking for part time jobs which are nothing but hourly jobs. Schools and colleges can be a very useful source for you as you can get hold of a number of candidates at the same time under the same roof. You can get in touch with the school or college authorities and arrange for a recruiting session. Hiring from schools and colleges has 2 sides. One, the chances of getting experienced candidates are minimum, therefore, if you are looking for some who has a fair amount of experience, then this is not the option you would want to avail. On the other hand, if you are looking for fresh candidates who are eager to learn and has high aspirations, then this is the perfect option for you. Often, candidates from schools and colleges opt to work because of their financial compulsions. Therefore, you can expect 100% dedication from them. It would be far more easy for you to train and nurture them and get them prepared for the job. These days, the internet has turned out to be as one of the most reliable and authentic means of hiring new recruits. There are innumerable online job portals, forums where you can find candidates from different backgrounds with different profiles. This is one of the easiest ways to get hold of good candidates. All you need to do is to mention your requirements and the rest will be taken care of by the online portal itself. They will keep on updating you about the probable candidates who matches your requirements. Once you think a particular candidate matches the profile you are looking for, it is time to call them for an interview where you can get to know what exactly they are all about, whether they are good enough to meet the needs. In case of hiring hourly employees, it is very important for you to keep in mind the legal aspects which are related to their hourly pays and overtime pays. These days, there are many agencies operating which can help you get the profile you are looking for. All you need to do is to get in touch with the best ones operating in the market, let them know about your requirements. From here on, it is their responsibility to find the best candidate for you. If you are in desperate need for a candidate, then you may even set a deadline for them. They would help you find one for you. The process of finding hourly employees is basically the same as it is for the salaried ones. You can either opt for the conventional ways or you may go to the internet and other external sources.